Justo ayer, el día que empezaba a declarar Correa en el juicio de la primera época de la Gürtel, me ha llegado la noticia. Ha sido aprobado el proyecto de tesis y plan de investigación “The color of corruption coverage in Spain” (descarga el pdf) que presenté en mayo. Así que ya soy oficialmente doctorando. Sólo me queda hacer la tesis. Correa es el acusado clave de la trama y por el que toma nombre el caso Gürtel, que es “correa” en alemán. Ahora un resumen de los últimos acontecimientos en cunato a la tesis se refiere. It’s been a busy week. Almost all the tasks are related to data gathering: tweets, front pages or video streaming. It is interesting how non trivial is to gather all the different information flows that surround as. I’ve re-started the coding the front page of the Spanish newspapers in PageOneX. Drawing areas of corruption. By the way, some new users are making new interesting threads with the tool. Researched different ways of “hunting” tweets. This reminds me to the uncompleted experiment I launched for collecting tweets with different methods. Fetch-Posts. Track keywords on Twitter using the public Streaming API https://github.com/driscoll/Fetch-Posts/blob/master/track_keywords.py, thanks @desconcentrado I hope we’ll make it work in my computer. Do you have other open source methods? Please share! There is an interesting article about this topic Working Within a Black Box:Transparency in the Collection and Production of Big Twitter Data by Kevin Driscoll and Shawn Walker. Cheered Mari Luz Congosto to relaunch t-hoarder.com, a platform that collects, visualizes and archives tweets about corruption in Spain. It is the main I plan to use for my PhD dissertation. I am going to help her document the tool to allow other researchers/activists install, use it and… share their data! By the way, we are looking for other people interested in installing their own instances of t-hoarder… or hosting our own instance. Do you have empty space in your server? 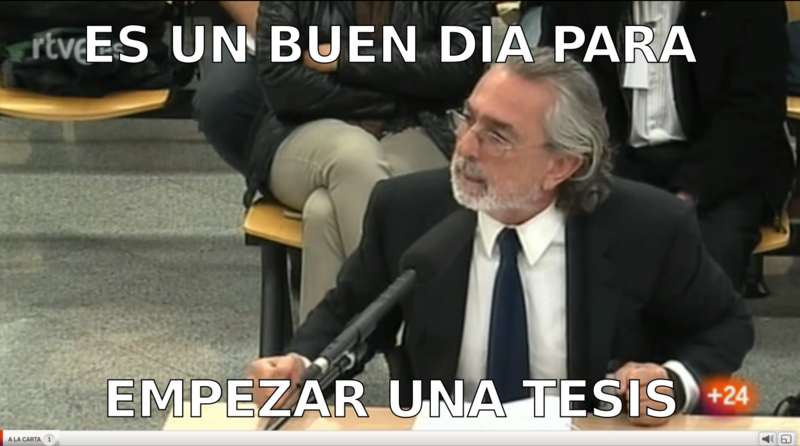 I’ve been recording the video streaming of the Gürtel trial, one of the main cases of corruption in Spain that involves the party in the government (PP), as I am not finding any public archive that does it for me. I’ve used Kazam to do it, so it means that I have to be there at the right moment. It is like going back to he ’80-’90 and recording with VHS. I have the video recording, the tweets of the day, the screenshots of the main online newspapers… I’ll be able to reconstruct on an minute basis one day in the media ecology of that particular corruption case. “hypotheses are too general. Here is my recommendation: the candidate defines the hypothesis thinking on the connection between the dependent and independent variables”. “The candidate will use three types of data, one related to front-pages of print media, another with the information about twitter, and public opinion. To do that the candidate not only will follow existing methodologies but will also use pageonex.com (elaborated by the author). Here it will be relevant to know something else about the operationalization of variables. I guess the unit of analysis is going to be stories (number of percentage? ), tweets (number? ), public opinion (percentage?) for one or two years (2016-2017). Also we need more information about which are the independent variables that will be taken into account. In general the methodology seems as appropriate for the plan but needs further elaboration in the future”. “In general, it is clear the author has analyzed some of the main contributions to the field, but there are some important shortcomings. There is not a discussion about which is the agenda setting role of the media, what we mean by that, why this is important, and which are the factors that limit the capabilities of the new and traditional media to develop this agenda setting role. (…) Accordingly, the theoretical part needs an elaborated discussion about the agenda setting role of the new and traditional media, highlighting the similarities and differences between the two and why this matters. To do that the author needs to analyze the literature about agenda setting taking into account authors like Norris to better understand the role of the media in a democracy, Graber and Iyengar to explain the agenda setting role of the media and the interconnection between different types of media outlets, Hallin and Mancini to better understand the media systems and why this matter (just to mention some of the most cited). “Faltaría, en algunos casos, trabar mejor la transición o la interconexión entre los distintos ámbitos de la investigación. En especial faltaría una mejor/mayor justificación de la (supuesta) disrupción que hacen los medios sociales en el panorama informativo y su papel de contrapeso con los medios tradicionale. (…) La parte del impacto de los nuevos medios en el establecimiento de la agenda debería reforzarse para que no quede coja respecto al resto de marco teórico. Por otra parte, la retroalimentación mútua entre los viejos y los medios nuevos/digitales debería perfilarse mejor para poder acabar de definir la metodología”. ¿Qué preguntas hacer a los datos pra no desbordarse? “La metodología es muy robusta y utilizará sobre todo dos grandes fuentes de datos, extensas, objetivas y relativamente fáciles de manipular. En este sentido, el reto será saber qué preguntas hacerles a los datos – de las muchas posibles dada la riqueza de los mismos – para que la investigación no se desborde”. “Sí, los objetivos, las preguntas y las hipótesis son claras y fundamentadas en el debate teórico. Sin embargo, falta una cierta profundidad de planteamiento que se queda en lo descriptivo. Ciertas cuestiones de fondo quedan implícitas o marginadas, como si la polarización es mayor en las redes sociales que en los medios de referencia o si los casos de corrupción preeminentes en ambas esferas (redes digitales y medios convencionales) difieren en cuanto a sus protagonistas. La primera cuestión se relacionaría con las dinámicas de polarización que se atribuyen a la esfera pública digital y la segunda, con el control que se atribuye a las fuentes oficiales en la agenda de los medios convencionales de referencia y a los alineamientos político-edioriales que se han percibido en la prensa española. Se recomienda un mayor énfasis en estas preguntas para facilitar un debate académico que haga aportaciones más allá del caso de estudio nacional que ahora se plantea”. “La bibiliografía recoge en extenso las principales contribuciones en el orden teórico y empírico, en el plano nacional e internacional. Se echa en falta, sin embargo, el conocimiento y la referencia a obras de autores españoles anteriores del año 2000 y anteriores que abordan el tema de la construcción de la agenda y de los marcos discursivos tanto en la teoría como en análisis de casos”. ¿Cómo visualizar los 10 millones que no votaron?